James Taylor, Dusty Springfield, Donny Hathaway, Petula Clark, Michael Jackson, Tom Jones, Cliff Richard, Barbara Streisand, Andy Williams & the 4 Seasons. Carole (Klein) was born on February 9, 1942, in Brooklyn, New York, learned the piano at the age of four, joined her first band whilst at high school and eventually changed her name to Carole King. She took up with Paul Simon, Neil Sedaka and Gerry Goffin. Sedaka’s hit Oh Carole was devoted to her. Barbra Streisand recorded Where You Lead, No Easy Way Down, Beautiful and Being At War With Each Other. During the 1990’s Gloria Estefan recorded It’s too Late, Linda Ronstadt a new version of Oh No Not My Baby Celine Dion did King's song The Reason on her 1997 album Let's Talk About Love and Jonathan Rayson recorded a new version of Beautiful in his 2006 release Shiny And New. James Taylor and Carole King were close friends and it was he who encouraged her to pursue a solo career. However, Carole’s only real successes as a composer/singer were her 1962 single It Might as Well Rain Until September and her landmark album Tapestry (1971). For 11 years Tapestry was the best selling album to be finally replaced by Michael Jackson's Thriller in 1982. Tapestry also produced the hit singles, So Far Away and the chart-topping It's Too Late with the flip side I Feel the Earth Move. Her 1971 album Music also hit number one, and generated the hit Sweet Seasons. In 1972 Rhymes & Reasons reached number two and 1974's Wrap Around Joy, featuring Jazzman reached number one. 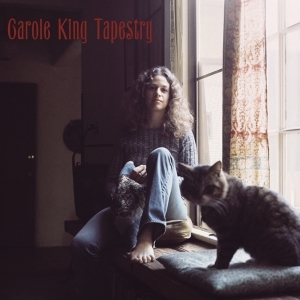 Why has Carol King's Tapestry stood the test of time? It's not just the superb melody or the wonderful rhythm. The secret is in her unpretentious, post-liberated woman singing. She means EVERY word, every phrase and it comes across. When the concert challenges (she never did like to perform in public) Carole King makes her songs, performed by more famous artists, seem like elevator music in comparison. The Tapestry Album was No.1 for 15 weeks, on the charts for more than six years, and earned four Grammies including Record of the Year (for It's Too Late) and Song of the Year (You've Got a Friend). In 1968 Carole married Charles Larkey, the marriage ended in divorce. In 1977 she married Rich Evers who died from a heroine overdose in 1978. After Rick Evers death Carole moved to a tiny mountain village in Idaho to become an environmental activist. In July 2004, Carole King re-launched her singing career with the Living Room Tour in Chicago, which resulted in Living Room Tour album in July of 2005. The tour continued through Canada, Australia and New Zealand. A DVD of the tour, called Welcome to My Living Room was released in October of 2007. The Living Room is a revival of songs from throughout her career with only her piano and acoustic guitars as accompaniment. Recently Carole King has been politically active in the United States Democratic Party. In 2003 she campaigned for John Kerry, whilst her lifelong friend James Taylor campaigned for George Bush. During the 2008 presidential campaign she stated that she was supporting Hillary Clinton and mentioned that the choice had nothing to do with gender. She also expressed that she would have no issues if Barack Obama were to win and she eventually also campaigned for him.